The following sermon was preached on March 31, 2019, being the Fourth Sunday in Lent, also known as “Laetare Sunday,” at the 8:30am Rite II and 11:00am Rite I Eucharist services at the Episcopal Church of the Ascension in Lafayette, Louisiana. 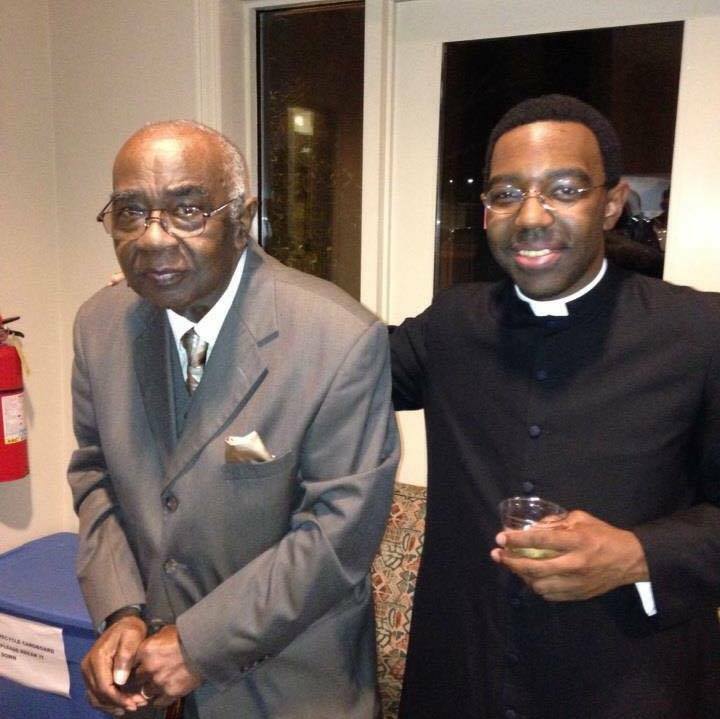 Featured Photo Description: Me with my late father, the Rev. Dr. John Leonard Parrish (August 9, 1933-October 17, 2016) after my ordination to the Sacred Priesthood at Canterbury Episcopal Chapel at the University of Alabama on Advent Sunday, December 2, 2012. My parents’ toleration for each other during my younger days was, for lack of a better description, not good. My mother, the “other woman” in a four-and-a-half-year on-again-off-again affair, was hurt when my father didn’t leave his first wife for her, as well as not marrying her when his wife died five months after I was born. This ignited in Mom a vicious vindictiveness towards Dad, displayed by pulling me the last minute from plans with my paternal family he would long make in advance. Trying his best to be a father to me, Dad was himself hurt by the vindictiveness and how, as a result, my visits with him and opportunities to know my paternal relatives were too few and far in between. When I was five, Dad grew tired of the fighting. He made a decision that would hurt the both of us but hopefully lead to a joyful reunion. “For a time,” Dad stepped away, pausing his efforts to have a relationship with me, leaving me to make the decision once I got older whether or not to resume, or, rather, actually begin our relationship. It was a risk, but one Dad, by then a serious Christian, made on total faith in God, trusting that He would make a way for us to be together again as father and son. “I will repay…the years that the swarming locust has eaten…,” (Joel 2.25) God promised His people in times of famine. For Dad and me, God’s restoration of our lost years came in 1997. Being a year from his “first” retirement after 40+ years in academic administration, Dad wrote Mom pleading to allow me back into his life and become reacquainted with my half/step-siblings, nieces, and nephews. Having seen the emotional effects of Dad’s absence on me, Mom agreed. On March 28, 1997 on the campus of the Mississippi School for the Blind in Jackson, after seven years of estrangement, God answered Dad’s prayer. Scurrying off the bus, shoving everyone out of my way, I saw Dad a little distance away. I immediately ran into his arms, me and him embracing and crying tears of joy. It was the first day of a 19-year renewed relationship God blessed Dad and I to have until his death. For the father in today’s Gospel, his younger son’s spendthrift ways cause their temporary separation; for my own father, it was circumstances beyond his younger son’s control. The common element in both stories is a father hoping to again embrace his son. And from this comes the Good News: no matter what circumstances, past sins, or offenses caused our separation, when we say, “Father, I have sinned against Heaven and before you,” (Luke 15.18; 15.21) God our Eternal and Compassionate Father joyfully embraces and receives us back as His children, for we who were dead became alive again; we who were lost became found. Most people call today’s Gospel the “Parable of the Prodigal Son,” focusing on the younger son who, having squandered his inheritance in dissolute living, returns home destitute to beg his father to receive him back as a servant. But the parable’s title and focus should be that of “the Loving Father,” who surprises his younger son by not scorning him but receiving him back with joyful celebration. The ring the father gives his son stands for the reestablishment of a right relationship between God our Loving and Eternal Father and us. That is what makes Jesus’ parable the best-known summary of all Sacred Scripture, the story of God’s constant quest for all of us. Jesus today reaffirms in His parable that the way to redemption is open to ALL willing to choose it. God’s reception of us back justifies us “by His grace…through the redemption that is in Christ Jesus, whom God put forward as a sacrifice of atonement by His blood, effective through faith.” (Romans 3.24-25) In the younger son’s return is the image of God re-presenting and one rediscovering God’s love that always remained, that to which we should aspire. And so, it is. We all need God’s mercy, which we can only receive through Jesus, His Only-Begotten Son our Savior. Regardless of who you are, what you have done, and how long ago you did it and/or have been away, God, full of compassion and mercy, sees you far off, yearning to run and embrace you. Your return will be for Him a grand celebration, for you His child who was dead will again be alive, once lost become found. To paraphrase the Church’s historic introit for this particular Lenten Sunday, “Rejoice! Rejoice greatly, all you who mourn, for you will delight in overflowing abundance.” Let us, then, be glad and celebrate. Let us altogether return to our Father’s house. “There’s a Wideness in God’s Mercy,” words by Frederick William Faber (1814-1863), commonly sung to the tune Beecher by John Zundel (1815-1882).